Publisher's blurb: "There are many mundane and supernatural beasts in the world, and there are those which push the boundaries of power in many ways. 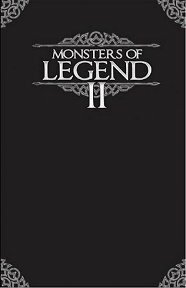 Some of the beings inside this book are true Monsters of Legend, power-houses of brute strength, demonic masters who shake mountains with their footsteps. These are monsters which seasoned adventurers should fear, respect and challenge in epic confrontations. "This book provides Game Masters with a resource for truly legendary and memorable encounters, from the powerful servitors of astral beings to the horned lackeys of the deepest and darkest Hells. There are new constructs, beasts and more within these pages. Some of these creatures could be adapted by Game Masters who want to use them as playable races in their campaign worlds. However, many are truly unique powers who have preyed on mortals for centuries."